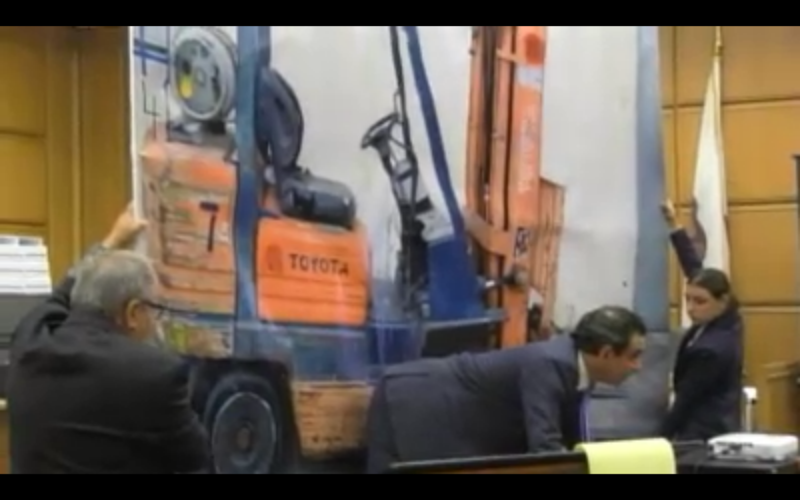 CVN screenshot of plaintiff attorney Steve Vartazarian kneeling in front of a photograph of the type of forklift that ran over his client's legs. Click here to see video from the trial. Los Angeles - A California state court jury hit the County of Los Angeles with a $10.8 million verdict on Thursday in a lawsuit filed by a man who suffered severe injuries when a county employee ran over his legs with a forklift. The jury deliberated for most of a day in a trial that began on August 10. They found the county liable for the injuries of James Cobb, who was 34 when the accident occurred in 2015 on the grounds of County USC Hospital. The award is more than double the county’s highest settlement offer, according to Cobb’s attorney Steve Vartazarian. Vartazarian told Courtroom View Network that the county offered to settle the case for $5 million during jury deliberations after initially making a $1.5 million settlement offer before the trial began. “They messed with the wrong trial attorney, and they got popped,” Vartazarian said. The county rejected an earlier settlement demand of $3 million, according to Vartazarian, in addition to a mid-trial offer to implement a so-called “high/low agreement” that would set a floor and cap on potential damages, even if the jury agreed to award a higher or lower amount. Defense attorneys in the case did not respond to requests for comment. During the trial they denied all liability for the accident and argued Cobb could have avoided the forklift if he’d paid better attention while walking through the crosswalk where the collision occurred. The full trial was webcast live and recorded gavel-to-gavel by CVN. At the time of the accident, Cobb, an employee of Classic Party Rentals, was working on the grounds of County USC Hospital to oversee a tent installation for two events happening on the campus. While walking through a crosswalk after parking his car, Cobb was struck from behind by a forklift driven by hospital employee John Hill, who allegedly failed to yield to Cobb and did not honk his horn to alert Cobb of his approach. The impact caused Cobb to fall forward, and the forklift then ran over both of his legs. During his closing argument, Vartazarian pitched his body forward in front of a massive life-size photograph of the forklift to show jurors how Cobb fell. He requested an award of approximately $15 million, describing to jurors how Cobb’s injuries required extensive surgery and ongoing rehabilitative treatment. The defense argued that Cobb was distracted due to using a cell phone just prior to the accident. Attorneys for the county maintained that Hill did honk his horn, but that after hearing it Cobb stepped into the forklift’s path instead of away from it. Vartazarian said he didn’t believe there are any issues that could serve as the basis for an appeal, noting that Judge Anthony Mohr kept the attorneys “on a pretty short leash” during the trial. “It’s a clean verdict,” he said. Vartazarian went on to say that the verdict should show other attorneys that with a good case and enough preparation, a jury’s verdict can far exceed even a multi-million settlement offer. “Don’t back down,“ he said. The full trial is available as part of CVN’s video archive, along with hundreds of other gavel-to-gavel civil jury trials from throughout California and the United States. Cobb is represented by Steve Vartazarian of the Vartazarian Law Firm. LA County is represented by Tomas Gueterres and Vanessa Evangelista of Collins Collins Muir + Stewart LLP. The case is James Cobb v. County of Los Angeles, case number BC582690 in the Superior Court of California for the County of Los Angeles.